Not the most attractive cover, it's unlikely to lure you to flick through it's pages but The Birmingham Cookbook is a celebration of the amazing food and drink in the UK's Second City, Birmingham and in the County of Warwickshire. It features over 35 stunning recipes, is packed with information on numerous eating places from local pubs to Michelin star restaurants. 160 pages, many in full colour, it is a book that is hard to put down once you get engrossed in the details about local chefs and their recipes. Edited by Ahmed Ahmed, the Editor of Dine Birmingham, he shares his inside knowledge about what makes the Birmingham dining scene so incredible. Birmingham is well-known for acres of parks, its clusters of barmy yet beautiful buildings and its miles of canals, the Venice of the Midlands, folk call it. 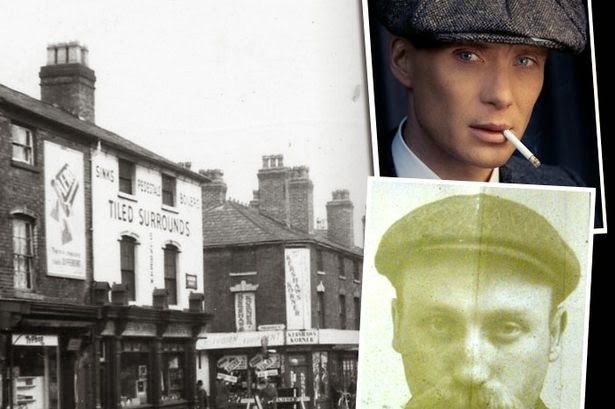 The true home of 'Peaky Blinders'. But these days, it's also home to an award-winning food scene; eating out here is like a gastronomic tour of the world, representing a huge array of cultures and nationalities. Everyone has a little piece of Birmingham in their kitchen - classic cupboard staples such as Bird's custard, Cadbury's chocolate and HP Sauce all started in the city. But it also boasts more Michelin-starred restaurants than any other UK city outside of London. The Birmingham Cookbook, is a definitive guide to the finest foodie hotspots in the region that we locals call the 'West Midlands', sharing stories and recipes from the people behind this exciting culinary community. There is something to suit everyone's palate, whether you love a balti, pub grub or farm-food. 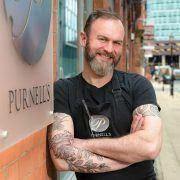 Michelin star chef, Glynn Purnell (above), provides a great Forward - being a Brummie himself, he opened his award-winning restaurant in 2003, the first starred eatery in the city and set the standards for today. The contents of The Birmingham Cookbook reads likely a who's who of top chefs and their establishments. 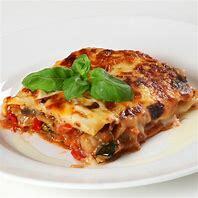 'Chef's recipes' form the basis for the book, with three or four dishes from each. Sectioned from 'Uniquely Modern', through 'Deli Delights', 'Country Inns' and 'Smoke', there is help in Wine Matching and Fine Wines. A Directory provides a final list of all establishments featured, their addresses and details and a short resume. 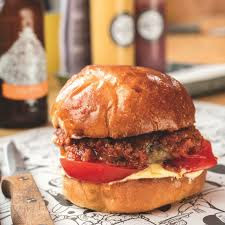 Of the 35 gorgeous hand-picked recipes, the best are too numerous to mention, but I loved the Slow- Cooked Lamb from the Kitchen Garden Cafe in Kings Heath and the Cheese Burger with Chorizo Jam and Garlic Mayo (below) from the Original Patty Man in Digbeth, near the Birmingham Coach Station. Birmingham's 'Shining Star' himself, Glyn Purnell, features with Beetroot Mousse with Escabeche of Vegetables - a favourite at Purnell's in Cornwall Street in the city centre. There really is something for all tastes and cultures in The Birmingham Cookbook - Polish food, Thai, Indian, Mexican and Moroccan, French and Chinese. The city is awash with food from around the world and so if you haven't visited yet, then now's the time! This book is the ideal foodie-guide. 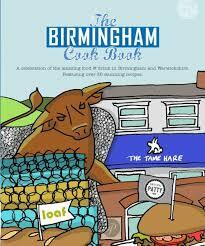 The Birmingham Cookbook is published by Meze Publishing (ISBN: 978-1-910863-10-7) and priced at £14.95 (Paperback). Available on eBay at £9.50. and on Amazon.